Vaira Vike-Freiberga is former President of Latvia. She was elected President by the Parliament in 1999 and was re-elected for a second term of four years in 2003. 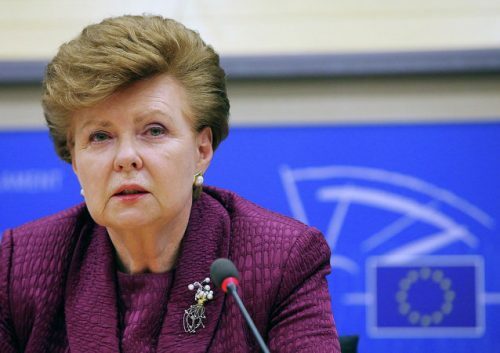 Now, Vaira Vike-Freiberga currently serves as the President of the World Leadership Aliance Club of Madrid, the world’s largest forum of former Heads of State and Government. She has actively exercised the powers conferred to the President by the Constitution of the Republic of Latvia and has played a leading role in achieving Latvia’s membership in NATO and the European Union. She is an invited speaker at numerous international events. Outspoken pundit on social issues, moral values, European historical dialogue, and democracy, she was awarded the 2005 Hannah Arendt Prize for political thought. Vike-Freiberga has held prominent positions in national and international scientific and scholarly organisations, as well as in a number of Canadian governmental, institutional, academic and interdisciplinary committees, where she acquired extensive administrative experience. She is a member of four Academies, and board member or patron of 30 international organizations, including the Board of Thinkers of the Boston Global Forum. She has also published 14 books and authored over 200 articles, essays or book chapters, and has given over 250 speeches, allocutions and scientific communications in English, French or Latvian, and gave numerous radio, TV and press interviews in various languages. She speaks Latvian, English, French, German and Spanish. Since 1999, she has received many medals and awards, twenty-seven Orders of Merit and ten honorary doctorates. On May 15, 2018, Vaira Vike-Freiberga was honored as the Distinguished Innovation Leader for her distinguished work in the humanities and social sciences by the Boston Global Forum and the Michael Dukakis Institute.